It’s been a while hasn’t it? Well, I have excuses and excuses as to why, (namely a new job and a dissertation to start) but I’m back with a blog tour!!! And this one is an amazing one (not just because it is a review based post but it’s a FREAKING THEATRE BASED BOOK)!!!! Of course, the second I saw it my “need to review” button was slamming- DID I MENTION I LOVE THEATRE/!?!??! Now I have to admit, I was buzzed af for this book but I had my reservations. As someone who lives and breathes theatre I was worried a book wouldn’t get the hours and the hard work that goes into making theatre the beautiful magical thing it is. But honestly? Theatrical gets it. Like it really does get the gruelling hours, the angry snaps and moments you have with your fellow castmates because you’ve been with them for 8 hours already and you just want to go to bed and sleep! But they are magic and beautiful and once you’re apart of one show, they never let go. In this story, we follow Hope Parker, who has dreams of going into Stage Management- but on her own terms and doesn’t want the fact that her mother, who is a renowned costume designer and incredibly famous, to influence anyone’s opinion of her or her work. She goes from strength to strength as she works with renowned directors and actors all whilst keeping it a secret from her family. At the beginning of the novel we find Hope applying for an internship at Earl’s Court Theatre to help with their next show; Piecekeepers, which just so happens to have a top director and a Hollywood star! Oh and of course a major crush! I am super excited and happy that Maggie clearly has done her research on what being in the theatre industry is like- I mean tea breaks are essential for everyone and even that’s there!! I don’t want to spoil anything in the book but if you love to read anything theatre-y then you can be safe in the knowledge that Maggie is incredibly accurate and obviously made me swoon within ten seconds of meeting the major crush! She is most definitely an author I would like to read more of! Grab a mug of tea, get comfy…today is the start of a blog tour for the brilliant book, The Goose Road! Yes that’s right hello!! It’s me, back with (yet another) blog tour, but today I’m spoiling you! Not only do you get my review, you also get a chance read a little extract of The Goose Road by Rowena House! Not enough? Okay, how about A GIVEAWAY!!!! Yep, you got it! I am giving you the chance to win one of 2 copies of The Goose Road! The Giveaway is UK only (sorry guys!) but more on that later. Big thanks to Jo who send me my copy of The Goose Road and is letting me have 2 winners! First up I’ll give you the extract (cause I’m nice like that), and I hope it’ll entice you to want to read more and enter the giveaway!! I’m turning hay in the top meadow when I hear the squeak of rusty wheels and look up to see Monsieur Nicolas, the postman, pedalling up the lane. I stiffen, suddenly afraid that I know the reason why he’s here. Please, God, let it not be Pascal. Soft summer sounds surround me now that I’m still. Grasshoppers. Distant birds. The eternal hum of bees. The creaking of the bicycle is like some infernal machine, let loose in the Garden of Eden. Please, God, not my brother, Pascal. Father left straightaway, but Pascal stayed long enough to show me how to gather the harvest, how to scythe and how to plough. I was twelve years old and so excited. Now my hands are calloused and my back aches like an old woman’s. Monsieur Nicolas clatters slowly past the orchard, waking the geese. They flap and hiss as they waddle towards the fence. Mother appears at the kitchen door, wiping her hands on her apron. Her back is very straight. Monsieur Nicolas clambers awkwardly off the saddle and pushes his bicycle up the hill towards our gate. I hold my breath. My legs shake. My vision blurs with tears. Monsieur Nicolas stops again. He rests his bike against our fence. The geese clamour and shriek as he opens the gate to our yard. Stifling a cry, I pick up my skirts and run. Relief bubbles inside me. I’m torn between laughter and tears. But when I reach out for the letter, Mother’s knuckles whiten as she tightens her grip on it. I hang my head, the pain in her voice cutting through me. For her sake, I try to remember something nice about him. One small thing. But I can’t. All I recall are his fists and his belt and his leather razor strop. Pascal got the worst of it, but sometimes late at night I’d hear Mother whimpering too. “Well?” she asks, sounding weary now rather than angry. My gaze remains fixed on the earthen floor and the dust-flecked shaft of sunlight falling across it while the ticking of the kitchen clock grows louder between us. Am I wicked, I wonder, a heartless, unforgivable child because I’m not sad he’s dead? I try to squeeze out a tear, but inside my head I can hear the thwack, thwack, thwack of his drunken anger, and Pascal’s sobs as he rushed up to his room, and Mother’s muffled voice through his closed door, hushing him, telling him not to fuss. apron off. “See to the animals,” she says, “then come in to change. I was utterly enchanted by The Goose Road, perhaps because I really like books set in wartime/in the past, or pehaphs because I really fell in love with the characters in The Goose Road especially René and Angélique! Now if you know me, I’m strictly against doing spoiler reviews (unless stated) and that is still the case here, as I want you to be urged into reading this book with the sheer knowledge that Rowena has a fantastic writing style, her prose and the way she writes is stunning. I was captivated from the first page and read the book in two sittings (I had to sleep). I am also struggling to believe that this is her debut as she is a wonderful story teller! I truly felt like I was Angélique keeping the family farm running and travelling across France. And another thing I adored, wait, LOVED, was that it was set in World War One, something (correct me if I’m wrong) is severly lacking in children’s literature? And with this year being the centinary of the end of the First World War I feel as though we will have a fair few more WW1 books being released. I just hope they are all as wonderful as Rowena’s. I mean if you skipped everything just for the giveaway then you must have amazing taste. The rules are simple for this giveaway. Number 1: Follow my Twitter, this will be where you are contacted by me to say you have won. Number 4: BONUS ENTRY! Comment below with a book recommendation! So this is a little later than planned and for that I apologise profusely!! 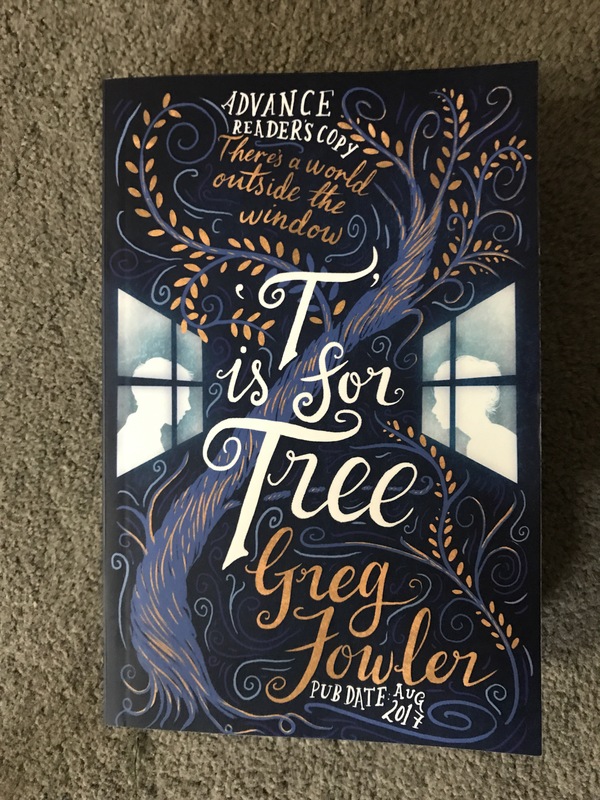 The lovely InkRoadBooks sent me an advanced reader copy of Greg Fowler’s “T Is For Tree” for a review. I began this book knowing nothing about it so for the first few chapters I was a littttle bit confused as to what was happening. Nevertheless I pursued it and am so glad I did! It starts off with a girl abandoning her newborn baby for some unknown reason. Which instantly had me curious as she seemed to have just given birth so must’ve been desperate to leave her baby after birth. Flash forward a few years and that little baby has grown up into Eddy. A boy whose grandmother doesn’t let him leave his bedroom except for the shower. My initial thoughts had me thinking this book is a different take on Nicola Yoon’s Everything, Everything with subtle notions of R J Palacios Wonder. All we know is that Eddy knows he’s different and he knows he’s not like everybody else and his grandmother abuses him. We also know he is friendless until a girl called Reagan moves in next door and there is a tree that grows near to his bedrooom window. It’s pretty clear that Eddy has Down Syndrome (whilst it’s not outright said it’s implied), but his grandmother abuses him which I instantly hated. The abuse is perhaps because she was resentful for her daughter for leaving the baby. I don’t want to spoil the rest of the book but after I got over the grandmother abusing Eddy I finished the book in a night. I was crying tears at the end because Greg Fowler took my heart and tore it apart! T is for Tree is poetically written and perfect for fans of characters that will grip you tightly and then break your heart. One stop for the frost, one for the fire…. I am on the fire blog tour (Cause I’m smokin’ hot 😉 ) but do check out the frost stop for it will chill you quicker than Jack Frost. “You may not find me so easy to burn,” Arcus replied, his eyes grimly assessing. “I would like to try,” I said between clenched teeth, heat rolling off me in waves. I started with a simple blast of hot air, something that might singe his robes. He barely lifted a finger, and the air came back at me, followed by a chill wind. I pushed out a hand, concentrating on the heat around my heart. A flame shot out from my palm and was quickly swallowed by a ball of frost. I thrust both arms at him and summoned a wall of fire, larger than I’d ever been able to create before. A sheet of ice came up to meet it. I sent another gust of heat toward the ice, melting it. He snapped a blast of cold back at me, making me stumble. Brother Thistle had restrained himself, I realized, allowing me gains and successes whenever we sparred. Arcus was giving me no quarter. I steadied myself, changed my position, and threw a series of arrows of heat from various angles. With dizzying speed, he dodged or repelled all of them. They fizzled and hissed as they hit the cool ground. “Your task is weeks away, and this is the best you can do?” he taunted. I breathed deeply as his barb struck home. It was exactly what I feared, that I wasn’t ready. With the hurt came a surge of anger. My blood heated and this time I didn’t try to stop it. “Be careful,” I warned, my voice low. He sent a spiral of frost at my neck. I batted it away. In an echo of my earlier move with fire arrows, he sent wicked shards of ice winging toward me. I parried, kicked, and melted them before they could connect. We traded blows that increased in pace and intensity. As he parried all my attacks, I grew frenzied. I sent out a blistering wind that could have burned many an enemy, but my aim was wide. But I couldn’t. A small part of me was still locked up tight, frightened of what I might do. “I won’t!” I shouted, blasting him with a wave of intense heat, which he deflected with a swirling cloud of frost. Rage uncoiled itself inside my chest, a sleeping tiger that had been poked too many times. Since the attack on my village, I had pushed down so many feelings— hurt, fear, anger, grief. Now I was glowing with white heat. I whipped my hand forward and back, releasing a tail of the dragon. A thick column of fire with a wicked end shot toward his chest. Arcus raised a hand to bring up a shield of frost. I thought I saw him stumble just slightly, but the flame hissed into a harm‑less cloud of steam. “We still have time,” the monk replied. My fingernails bit into my palms. No matter how hard I tried, he was always better. He had all the power, and mine was nothing in comparison. And like all Frostbloods in this land, he held dominion over me. In my fury, the gains I had made, the way I had come to see Arcus as an ally— all that disappeared. Pain lit my heart and spewed up hate, the way fire belches smoke. I whipped my hand forward, aiming for his back. But instead it was his hood that erupted in flames. Arcus cried out and fell to his knees. I love fantasy. It has to be said, I just crave a fantasy that delivers and Frostblood does just that. Elly creates a world that seems overdone yet is anything but. Frostblood follows Ruby who is a Fireblood; a girl with the ability to produce flames and magnificent warmth in a world that is paved with Frostbloods. This is not your average YA that has two sides against one another. This is much more elemental, this is Fire against Ice and it is brilliant!! Normally it can take a while for any action to begin in a fantasy novel; particularly in a YA fantasy but this is not the case in Frostblood. It is action packed within a few pages! Not too much romance too as this can often lead to a love//hate relationship with a book for me. Elly has mixed in the perfect amount of suspense, action and romance in Frostblood which kept me up into the wee hours of the night just to find out what happens next! Ruby is a girl who has vowed to seek revenge on the King and with an unlikely alliance from stone cold Arcus, she must travel to the heart of the empire to avenge her people. Now seriously guys, that immediately drew me in! The world building and the fantastic backstory to the rivalry between Ice and Fire had me glued to the book! Usually, with a YA book I find it hard to connect with the main character, this was not the case for Ruby. It was insta love for me with her character! The twists and turns that are involved in this book will make you gasp for breath as you delve deeper into the story, to purloin a cliche in many a YA book; you’ll let go of breathes you won’t realise you are holding. Frostblood will captivate you in ways you can’t even imagine; I look forward to reading the next chapter of this magnificently addictive series! Spent my bank-holiday reading some books for my dissertation. Each one is incredibly insightful and engaging AF without being in-your-face and difficult to digest! #qotd what book do you WISH was around when you were a teenager? . . . . . . #aotd I wish Feminists Don’t Wear Pink had been around as it’s really informative and you can dip in and out if it! Share book reviews and ratings with The Book Club, and even join a book club on Goodreads.